Since posting the pictures of Gaudi, I’ve had several people ask what the trick was to the roaning on his coat. Unfortunately there isn’t any real trick – no special tool or technique. The pattern was created using a #11 Xacto blade, or rather dozens of those blades. (I set the blade aside as soon as it begins to dull, and that happens pretty quickly when it is being scraped against ceramic bisque.) 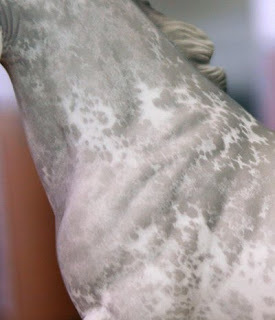 The process isn’t really all that different from the etching some use to customize factory finish plastic horses, though potters usually use the term “scraffito”. So there isn’t really a trick, other than training yourself to maintain a really light touch with the blade. It also helps if you work in small areas for short periods of time. The temptation to rush and the mind’s tendency to create a regimented pattern are the biggest obstacles to achieving a realistic roaning pattern. That means they take a lot longer than it seems they should, but the end result is pretty cool. As I mentioned in the previous post, I am working on a number of sabinos right now. I thought I would show some pictures of how that kind of color is done in ceramic underglaze. White hair detail like the kind seen on sabino roans are done with a process similar to what cold painters call etching – though ceramic artists call it scritching. Until the underglazes are fired, ceramic paint is chalky and easily marred. Since the base material (the earthenware clay) is white, ceramic artists often take advantage of that fact when they need to add white markings or white hairs. Most of the time the favored tool is a very sharp #11 Xacto blade. 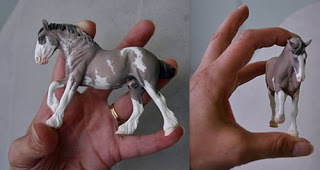 With my own horses I use a wide variety of blades (many sharp, but some dulled) and erasers to get just the right effect. I will sometimes use an initial layer (or layers) of white underglaze to get the right effect. That is what I did with the guy pictured in the previous post. 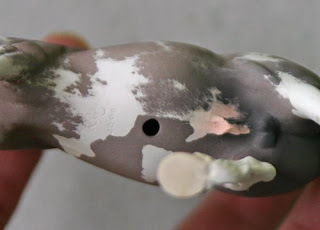 There is a light layer of opaque white underglaze under his gray areas. Without this, the transparent colors I have used for his body color are difficult to remove. I’ve only used a light layer, though, because I want a softer effect. In general, the thicker the layer of white the crisper the edges will be. 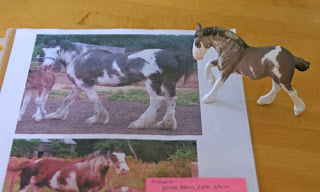 In the previous picture I had started adding the irregular roaning of his sabino pattern. This side, however, has not yet been detailed. This is how he looked right after his base color was sprayed and the latex masking was removed. The latex is too gloppy to mask the actual pattern, so only the whitest areas are covered. The real outline of the pattern, as well as all the hair detailing, will be done with the blades and erasers. This picture also shows just how flat and chalky the underglazes are. 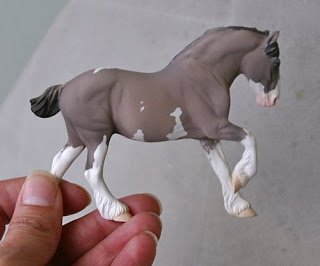 Underglazes begin to look opaque long before they really are, so the body color often looks quite flat until after the horse has been through the final glaze firing. That’s why most glazers paint by memory, rather than by sight. Remembering how many times you hit an area, and how hard you hit it, is the most reliable way to predict the end coloring. Here is the belly showing one side that has been detailed using scritching, while the other side is largely untouched. I tend to work one side at a time, which was a habit I developed long ago when I was a cold painter. I wish I had the discipline to paint one part (like the whole head, or all the legs) at a time, but I always get impatient to see one finished side. And here is my sabino guy with one side fully scritched, sitting next to the sheet protector holding the set of reference pictures I was working from with him. I don’t usually work this closely from a specific horse, but I wanted to address a certain set of issues with this piece so I’ve been staying pretty close to the picture. Since taking these pictures, his second side is half-finished. His firing buddy, a sabino Voltage, is not quite so far along. She has a lot more area to scritch, and a considerably larger amount of white. I’ve been taking pictures of her in-progress, too, but I want to post hers as a group once she is done. I have high hopes that at least some of these guys will be in their final, shiny form by the end of the week. Maybe by then I will have made a decision what color to paint my Vixen!